Today's post is taking a slightly different path, to talk about something that I think is incredibly important and very timely. Yesterday, the Senate voted to advance a bill that would repeal the Affordable Care Act/ObamaCare, and I want to talk a little bit about why this matters to me, and why I think it should matter to you, too. I don't want this blog to only be about my disability, since my life is so much more than that. But just like I can have SMA and still care about skincare and style and makeup, I can care about those things and also care about access to healthcare. I think that's important for people to see. I realize that not everyone agrees on how healthcare should be delivered and provided in the U.S., but I hope that everyone realizes how important access to healthcare is - that's something that has been made clear to me through my work in public health. I don't think that anyone would argue that people should not have access to healthcare, at least on a fundamental level. But for me, this is a personal issue. Living with SMA is not cheap, medically. I have a primary care physician, a neurologist, a pulmonologist, and a gastroenterologist. I have breathing machines that I use to make sure my lungs don't lose any more capacity than they already have. I have a very expensive power wheelchair that I rely on to be able to do anything, and use an accessible minivan to be able to go anywhere in my wheelchair. These are all medical things that I need just to live my life normally. I'm also on a waiver program that allows me to receive what's called "home and community based services" - this means that I get to live in a house or apartment rather than living in an institution. All of this is to say that access to healthcare is vital to me. It's more than just a fundamental issue that I believe in - it's something that keeps me alive and keeps me living a life that I'm happy with. I don't think that the fact that I have SMA should mean that I don't get to live less of a life than anyone else does. It can be easy to forget that people like me - people with a disability - are more than just a diagnosis. I have a social life, I have a career, I have goals - I just need some extra assistance to get through the day. I understand that healthcare is expensive, and that I'm costing taxpayers money by living. But I think as a society, we have to decide if we care more about people's lives, or more about money - because at the most basic level, that is what it comes down to. I also realize that ObamaCare, as it exists right now, isn't perfect. But the solution can't be taking away people's healthcare. With that being said, I want to encourage you to reach out to your Senators. E-mailing and Tweeting is good, but faxing and calling are better. Resistbot, pictured above, is a handy "bot" that you can text, and it will send a fax to your Senators for you. It asks for your zip code, your name, and your message - that's it. It's an incredibly simple way to participate and make sure that your voice is heard. 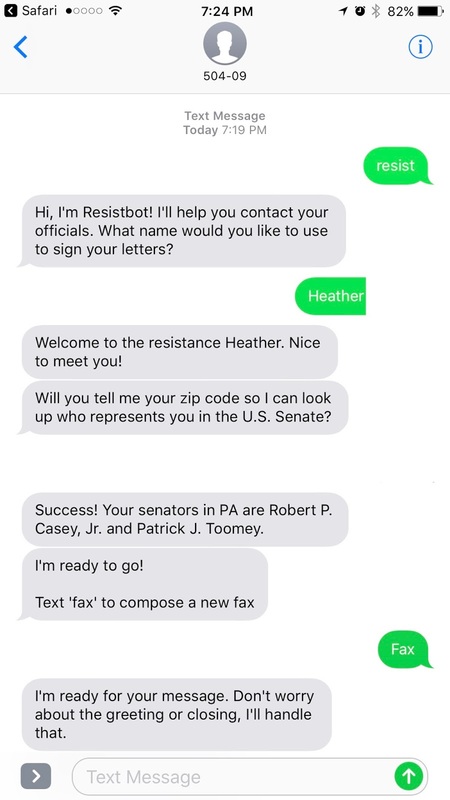 The ease of Resistbot takes away all of the excuses that we fall back on usually - I don't have time, I don't know who to call. Just take five minutes and contact your Senator now - you really can make a difference!